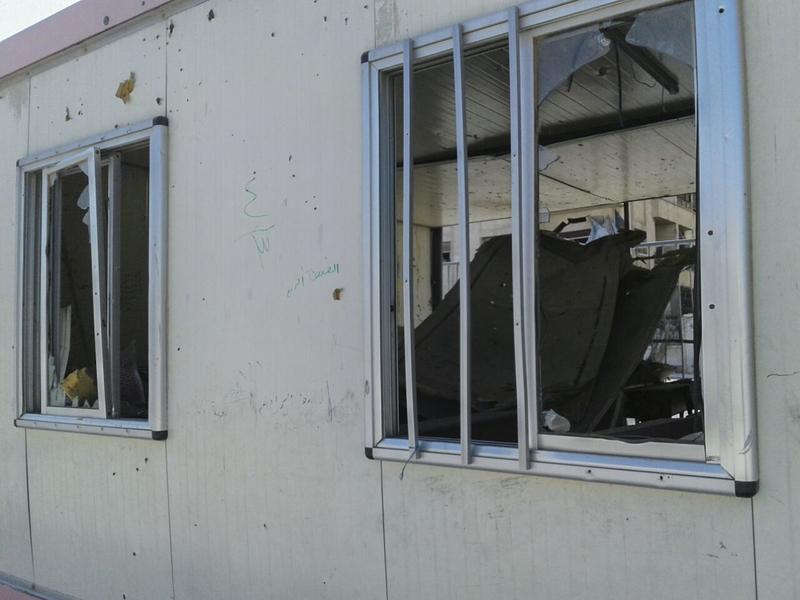 ©UNICEF/ Syria 2016- Broken windows at the 1070 school caused in recent attacks and fighting. Aleppo, Syrian Arab Republic, 18 August 2016 – The life of a child in Aleppo has become even more dangerous in recent weeks, as intense attacks and fighting escalate across the city. At a time when children are at even greater risk of bombardments and fighting in Syria, education has become another casualty. 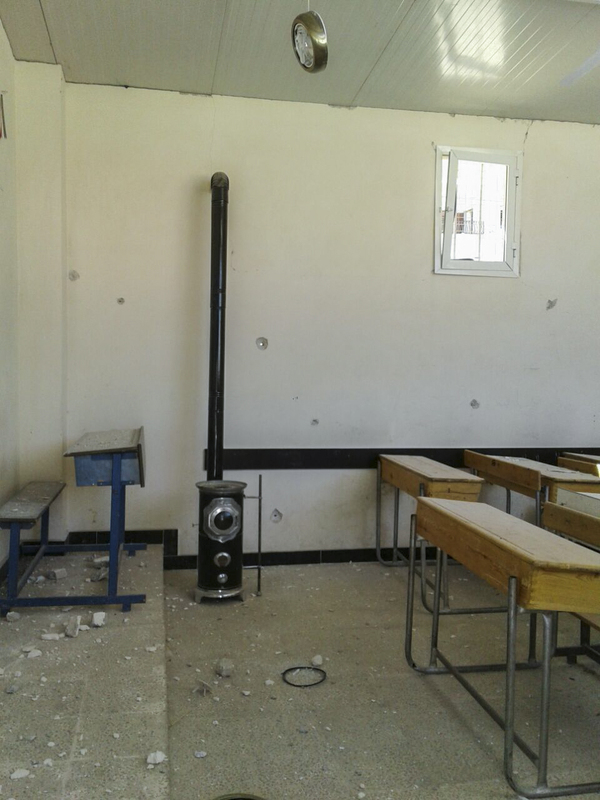 Schools in Aleppo have come under attack, are being occupied by fighters, and are left destroyed or damaged. The 1070 neighbourhood school provided a respite from what is often a harsh reality for 5,000 families who lived in the half-built concrete tower blocks of the settlement for displaced families in the suburbs of western Aleppo. A place of hope where children could start to build new futures. As families fleeing the fighting in rural areas resettled in the neighbourhoods of 1070, Tishreen and Al- Riyadeh in 2013, existing schools became overstretched. UNICEF built the new 1070 school, the only girls’ intermediary school in the neighbourhood, installing 17 prefabricated classrooms with toilet and sanitation facilities. Starting with 660 students, an additional 15 prefabricated classrooms were installed in 2015, and through UNICEF’s “Back-to-Learning” campaigns at the beginning of the academic years in 2014-15 and 2015-16 enrolment increased to 2,500 students. 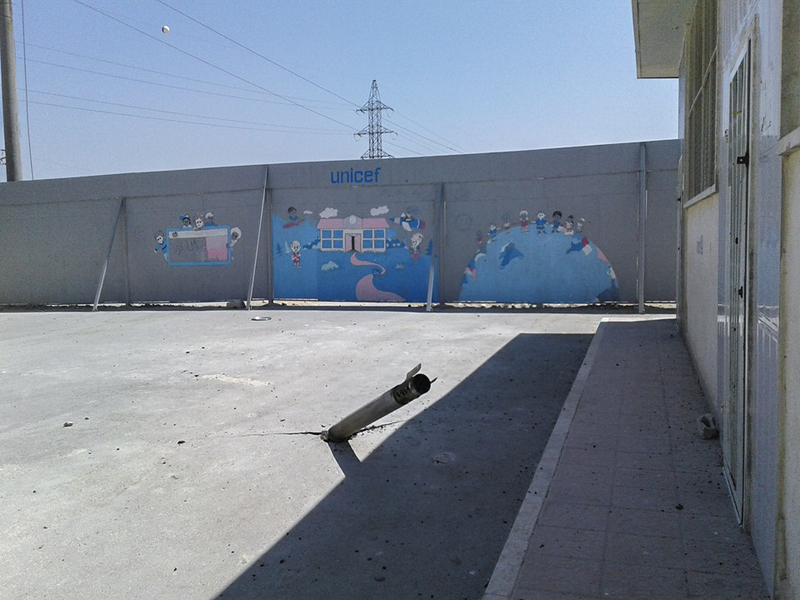 ©UNICEF/ Syria 2016 – Bullets penetrated the walls of the prefabricated classrooms provided by UNICEF at the 1070 school in Aleppo, as ongoing attacks and fighting have damaged 12 schools in the city. Across Aleppo city, UNICEF has installed a total of 130 prefabricated classrooms in response to the education needs of displaced children. Hanaa Singer, UNICEF’s Representative in Syria, visited the 1070 school in February this year to meet students and teachers. But the girls also told Singer of the dangers they faced just to come to school, and of their fears of going out to play in the playground during the breaks. “I listened in disbelief as the girls informed me about the sniper nearby, who seemed to take pleasure in tormenting the students by aiming at them every now and then, to scare them off. All the children asked for was “a wall“, to protect them and allow them moments of respite during breaks,” said Singer. With ongoing fighting still affecting the neighbourhood, 35,000 people remain displaced – some are sheltering in emergency relief centres, some with families and friends, and others in mosques and parks and streets. The 1070 school is badly damaged. On 9 August, the head teacher was able to briefly visit the school. Since 31 July, in Aleppo, 12 schools have been damaged by bombardment and fighting, with another eight schools occupied by fighters. All 20 schools are in neighbourhoods surrounding the 1070 school. Children’s access to education in Aleppo is threatened, just as students all over Syria are due to go back to school in September. UNICEF is gearing up its support in Aleppo and across the country, including its focus on helping the 2.1 million children out of school get back to learning. Students and teachers don’t know when they will be able to return to their cherished 1070 school. UNICEF is working with Aleppo education authorities to make sure displaced students do not miss out on education. With so many schools damaged or still affected by the fighting, alternatives are being planned. At the same time, UNICEF is preparing to scale up its self-learning programme, designed to support children keep learning until they can return to school. UNICEF has scaled up its relief efforts for the now 35,000 people displaced across the western parts of the city by recent fighting. UNICEF is supporting mobile clinics outreaching with pediatric, nutrition and maternal health services to displaced families, as well as mobile pyscho-social support teams. With partners, UNICEF has delivered clothes for displaced children. The whole city of Aleppo faces a water crisis, putting children and families in danger of outbreaks of waterborne diseases. Just as schools have been damaged by the current escalation of fighting, so was the key electricity infrastructure needed to power water stations that pump water to the entire population of two million. Ongoing fighting still prevents repairs. In response, UNICEF and our partners massively scaled up emergency water services. But repairs to electricity infrastructure are critical as pumping water is the only way to meet the needs of the city’s two million residents. Unless water pumping is restored children and families will be forced to resort to unsafe water sources, with grave risk of outbreaks of waterborne diseases.